It can be overwhelming and even disheartening to see a hemangioma develop on your newborn’s face just weeks after delivery. Hemangiomas are a type of vascular malformation or birthmark that looks much like a strawberry, or a bright red patch of raised skin. While they can appear anywhere on the body, they typically develop on the face or neck around 3 weeks of age. Infantile hemangiomas commonly continue to grow for the next 3 to 6 months. It is not clear exactly why hemangiomas form, but we do know that the risk factors include female gender, prematurity, twin birth, and problems associated with pregnancy or delivery. “I love my baby just the way he is, why should I be concerned?” This can be a typical attitude of a new parent, and one we certainly applaud. However, when hemangiomas appear on the face, cosmetics are not the only concern. If they appear on or next to certain facial features, there are long-term risks involved that could affect your child the rest of his or her life. In addition, while a hemangioma can fade away during or after elementary school, your child may suffer the consequences of teasing and peer ridicule in the meantime. Furthermore, larger and more raised hemangiomas can leave behind excess skin or fibro fatty changes that leave permanent disfigurement. As mentioned before, there are certain types and locations of hemangiomas that need to be addressed immediately, to either prevent functional impairment or permanent disfigurement. It is best to seek treatment if the following is true for your infant’s facial hemangioma? When a parent is considering hemangioma removal for a newborn’s face, it is not hard to convince them how important it is to choose a skilled and qualified surgeon. Not only is this a procedure for your infant’s face, but hemangioma treatment can result in significant blood loss. Dr. Talei is nationally recognized for his expertise in this field of plastic surgery. He prefers to treat these malformations as soon as possible to eliminate any unnecessary psychological effects or disfigurement. should be performed by a highly trained and experienced surgeon. Dr. Talei has dual fellowship training in facial cosmetic and reconstructive surgery and he uses laser surgery for most vascular birthmarks and congenital anomalies. 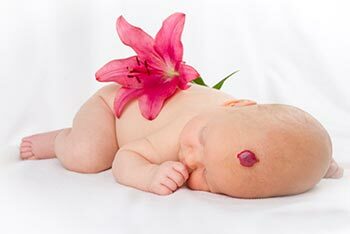 Call today to schedule your infantile hemangioma removal procedure with Beverly Hills’ finest surgeon. « Facial Plastic Surgery After Weight Loss: Are You a Candidate?